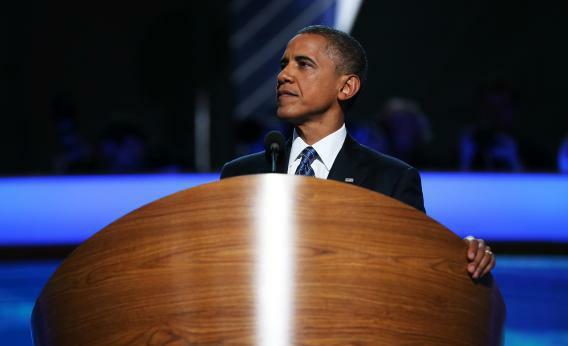 Obama convention speech: He made a mistake by not outlining a second-term agenda. U.S. President Barack Obama speaks on stage as he accepts the nomination for president Thursday at Time Warner Cable Arena in Charlotte, N.C. Photograph by Tom Pennington/Getty Images. For political junkies, the past two weeks have been heaven. The all you-can-eat buffet of speeches, the staged ovations, and the gauzy clichés have reaffirmed that American politics is still all it has usually been. Through this haze, however, a fundamental choice on values and policy did emerge—a choice clarified by the brilliance of Bill Clinton in his deconstruction of the Republican agenda and praise for Present Obama has done. Yet the reality of today’s job numbers—only 96,000 net new jobs created and a work force participation rate of 63.5 percent, the lowest in 30 years—reaffirms what we already know: We are still in a serious crisis. All of which is what left me feeling a bit empty after the president’s speech: What exactly is the agenda for the next four years? His priorities are surely better than those of the Republicans. And give him credit: He even spoke directly about global warming. But it is not clear to me that he is ready to push for the genuine control of health care costs that might ensure that the government can afford the investments in the areas that most need it: education, infrastructure, basic R&D, and protection of the safety net for the poor. Contrast this with the announcement, hardly noticed, that China is initiating a $156 billion infrastructure investment plan to build more subways and highways as part of an effort to confront the economic slowdown there. China’s growth rate has slipped all the way down to 7.6 percent. Ours, by contrast, is 1.7 percent. The singular success of the Obama administration on the economic front was the auto bailout and accompanying reform package. The lesson from it should be that bold investments can pay off: The political courage to go big will get the president re-elected, and saved an entire sector of our economy. We need more of those grand bets, not fewer. The crisis of 2008 may have been stopped, but the trends of declining middle-class incomes and a shrinking workforce have not.